Y’all, can I just say? I’m exhausted. Just absolutely spent. 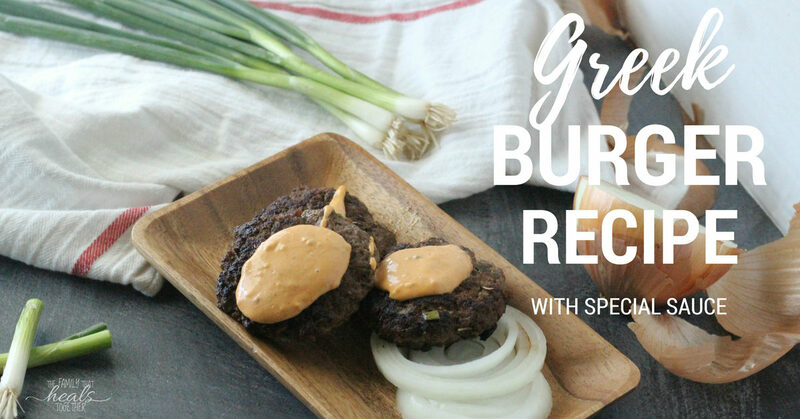 Preparing for a move has kicked my tail and I’ve been in need of super fast and simple meals (like this Greek burger recipe). The kids can feel the stress mounting and it feels like I’m just chasing my tail. And I’ve told you about what a handful Mister Two is right now, bless ‘im. I mean, he’s just a typical two-year-old with a two-year-old ‘tude, but dude… two-year-old’s are tough. So, anyways, Mister Two was sick with this awful stomach bug last week that had him puking on his brother’s head in the middle of the night (honest, that really happened). And then… he got sick in other ways… and even though he’s newly potty-trained, sometimes well-trained toddlers make, um, messes. So I’ve been cleaning up messes and as I was lamenting to Mr. Incredible the other night (after the kids were blessedly in bed- praiseJesuscanIgetanamen?!) how wiped out I was from cleaning up after little mister… along with his three brothers, and let’s be honest, I was being a complain-y-plainerton (I call my kids this sometimes when they complain about chores or schoolwork. I make words up. ), little man walked into the room… covered in nail polish from head to toe. I thought he was asleep, man. When I walked into the bedroom to assess the damage, I found more nail polish all over my new quilt. I cried. Actually cried. And Mr. Incredible whisked that pretty quilt away to the garage and proceeded to get it clean with mineral spirits. Color me impressed. There’s a reason I call him Mr. Incredible. And I just told you this whole long story to explain why Mister Two’s fingernails are painted my favorite rainy-day-gray in the photo below (he always insists I get a photo with his hands if he’s around while I’m shooting food). And also to explain why I’m exhausted. The saddest part is that I’d set out the polish because I’d wanted to paint my nails days prior, but never got around to it, because kids. (Is there ever a good time to paint your fingernails when you’re the mother of four small gremlins children?) So, now I get to see my own bare nails while I look down at his polished fingers and toes with envy. But you came here for the Greek burger recipe, no? 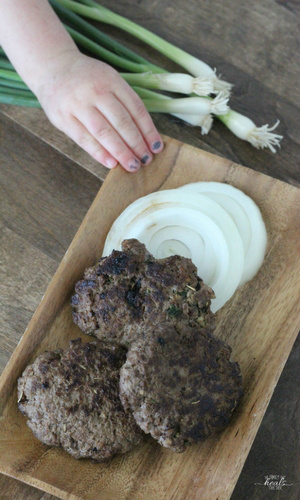 I’ve been making versions of this Greek burger recipe for months, and I was surprised at how much the kids liked it the first time I made it. 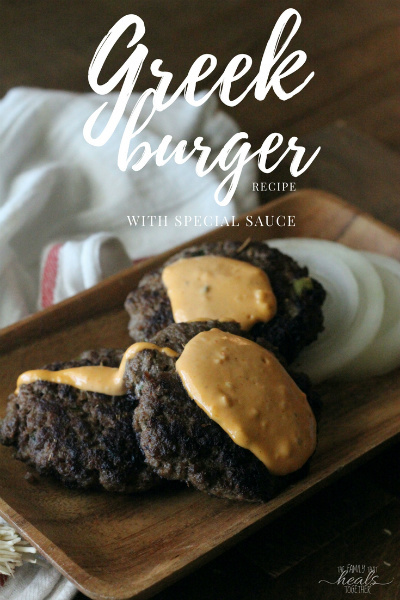 Kids are notoriously picky, but even packed with various herbs and flavors, they cannot get enough of these burgers. And I love that they take me no time at all to whip up. Preheat avocado oil in a large cast iron skillet over medium heat. Combine remaining ingredients in a large mixing bowl and stir until well-combined. Place patties in pre-heated avocado oil and fry for 4-6 minutes on one side, before flipping and frying another 3 or 4 minutes on the second side. Cook patties to your preferred done-ness before moving to a plate to cool before serving. Serve with special sauce and wrap in lettuce, if desired. Combine ingredients in a blender and pulse until blended. Store in an airtight container in the refrigerator. Yes, you are out numbered: one Mom to one 2 year old is not even! (Our 2 year old is #4 of 5 children.) Nail polish? I haven’t even looked at my nail polish in years! lol I just found your blog from Food Renegade and am enjoying browsing your posts. Oh… The burgers sound tasty, too! I like Greek flavors. Hi Mrs. D. Glad you get it. 😉 Thanks for stopping by!